Gavin Smith’s remains were found in a shallow grave by a man walking with his dog last Oct. 26 in a rural area on the south side of Palmdale near the border with Acton. 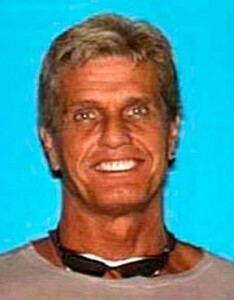 LOS ANGELES – A San Fernando Valley drug dealer was sentenced Tuesday to 11 years in prison for killing 20th Century Fox distribution executive Gavin Smith, whose remains were found in a shallow grave in the Angeles National Forest in the Antelope Valley about 2 1/2 years after he disappeared. John Lenzie Creech, 45, was convicted July 3 of voluntary manslaughter for the May 2012 beating death of Smith, a married father of three, according to Deputy District Attorney Bobby Grace. “It was a very difficult case — with a lot of twists and turns,” Grace said outside court on the day the verdict was read. Creech showed no reaction as the verdict was read. Smith’s wife cried in the courtroom audience, but she and her family declined to comment on the verdict outside court. Grace said the jury appeared to have accepted a “heat of passion” argument, in which the defendant was said to have been provoked to violence by the knowledge of his estranged wife’s affair with Smith. “There was an affair and he found out about it,” Grace said of Creech, adding that the “infidelity” aspect of the case probably helped explain the jury’s decision. In his closing argument, Grace told the jury that Smith “was executed in cold blood by this defendant, who hit him repeatedly in the face” after using a cell phone with GPS to track down his estranged wife, Chandrika Cade, and sneak up on the two in Smith’s Mercedes-Benz. “You don’t accidentally beat someone to death,” the prosecutor said in his rebuttal argument. Defense attorney Irene Nunez told the panel that Creech had made “errors in judgment” by concealing Smith’s body and car after lawfully defending himself in a fight that he testified was initiated by Smith, but argued he was not guilty of first-degree murder. Creech’s lawyer acknowledged her client is a “convicted drug seller” but said he “had to fight for his life” after the man who had “intruded” into his life and marriage approached him outside the Mercedes with a weapon following a fistfight between the two men inside the sedan. Acquitting her client would be the “only just verdict,” she told the jury. Grace said Creech and Cade had an “unconventional marriage” in which the two “both cheated on each other,” and that it was “essentially a countdown to murder” when Creech “first uttered the threat” to Smith’s two sons in 2010 that he would kill Smith if he continued to see Cade. Creech told the jury that he took “full accountability” for failing to call 911 after what he described as mutual combat or to seek help for Smith, who was a member of UCLA’s 1975 NCAA-winning basketball team under Coach John Wooden and had worked for 20th Century Fox for 18 years. Those attempts to cover up the killing included burning his and Cade’s clothes from that night in the family fireplace and hiding Smith’s body in various locations for nearly a week before dragging it up a hill to the remote area where he buried it, according to trial testimony. Creech could have faced a maximum of life in prison without the possibility of parole if he had been convicted of first-degree murder and if jurors had found true the special circumstance allegation of murder while lying in wait. “The jury clearly decided that he will have to pay a penalty for killing Gavin Smith,” Grace said. During the trial, Grace said Smith and Cade initially met at a rehabilitation facility for prescription drug abuse. He said Smith became addicted after years of medication for a back injury suffered when he worked as a movie stuntman earlier in life. Their affair — which began in 2008 — broke off the following year after Smith was confronted by his own wife. But Smith and Cade began exchanging e-mail messages again in 2010, Grace said. When Smith’s wife found out, she drove with two of her sons to Creech’s house, where Creech told Smith’s two sons, “You saved your father’s life by coming here today,” according to the prosecutor. Two years later, however, when the romance rekindled again, Creech made good on his threat to kill Smith, Grace said. 28 comments for "Man gets 11 years for 2012 beating death of Fox executive found dead in the AV"
He was way in over his head. With all due respect, I believe your second sentence is incorrect. I wish Hardin and Curry could shoot 10-foot jumpers off their spots for my team. You all know Smith was no angel. Smith was 57 thats not a senior citizen. The man was in better shape than Creech who at the time was 43. In my mind it kind of was a fair fight. Now im not defending Creech but you cant blame the guy Smith was doing his wife after Creech told him what would happen if he didn’t stop. In some areas Creech would have spent no time in prison. Now hiding the body and car was total prison time worth. If he would have called the cops his charge would have been a crime of passion. With a good lawyer that would have been time served with three years probation. Ever notice how the mexifornians always side with the hoodlums, the punks, the gangbangers, and the drug dealers? World record for the most time ever dropped from a sentence, playing the Jesus card, my vote goes to television actor, Robert Blake. Stung for a paternity suit by his gold-digger wife, he decided she had to be snuffed. On trial, Blake played the Jesus card to such perfection, not only did he beat a capitol murder rap? Seven decades in Hollywood, Blake knew his way around television media; exactly what buttons he had to push, and how, and when. Playing the Jesus card like a heavenly harp, Blake was summarily acquitted from what would have otherwise been a certain death sentence. Had Creech the presence of mind to play the Jesus card, he would have walked, scoff-free. Re: Your comment “It’s a shame we can not be as smart as Tim Scott”. Listen, at times I vehemently disagree with Tim, and you can say a lot of things about him, but you can’t question his intellect. So your comment was meant as an insult, but I find it to be a true statement. The level of discourse would be much higher here. I’m usually incorrect. The only time I open my mouth is to change feet. But didn’t you just engage in that type of behavior? With all due respect, your argument didn’t have much substance. I’ll be meeting for coffee with Mr Malpractice pretty soon Ruby. Would you like to suggest some sort of evidence he should check regarding my “intellectual reality”? Hallmark characteristic of a sanctuary city, (1) different laws for different people, and (2) soft on crime. Where else but the sanctuary state of Mexifornia could a career criminal, a convicted drug dealer, get his murder-I rap knocked down, to Man-I? (1) States assertions as if they were facts, making no effort to support them. (2) Uses meaningless made up terms picked up from extremist gatherings and/or websites. (3) Throws together events/ideas as if they have a causal connection that supports the point without demonstrating that they are connected at all, or even accurate. That would depend on the judge…which is why we have a jury system. Perhaps you would be more comfortable under some totalitarian regime? John Creech, breathed a sigh of relief. Life sure doesn’t seem to be worth much anymore. Only 11 years for murdering someone? The conviction was for voluntary manslaughter, not murder. Smith was not alive to tell his side so Creech and his lawyer looked at the case and said “ok, here is what we are going to SAY happened”, to fit the evidence the DA had. I would bet Creech was guilty of a lot more. I wouldn’t bet either way, but I usually accept what the jury system says in cases like this. Just pointing out that he didn’t get 11 years for murder, he got 11 years for manslaughter. It’s a shame we can not be as smart as Tim Scott. But it’s a good thing that so few people are dumb enough to leave a pointless comment like yours Bobr, so take heart. Yes, (ManOfTruth), John Creech was already serving an eight-year sentence for the sale of a controlled substance, when he was charged in the slaying. He’s been in the illegal business for a long time as a middle-man. He breathed a sigh of relief when he was convicted of voluntary manslaughter. A big sigh. Yeah, Kay, and Thelma makes a very good argument that he’ll be out in three, along with innumerable other predators and violent criminals. And the state wants to take the guns away from law abiding citizens. Sometimes I feel like a US expatriate and stranger in the strange land of Mexifornia. I know guys, if I don’t like it just leave. Can I take the weather and mountains with me? PS: And unless you’re a veteran or currently serve our country (USA, lol), don’t you dare tell me to leave.